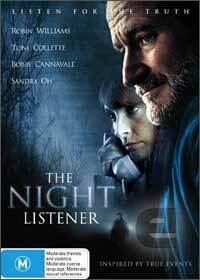 The Night Listener is one of those strange movies that really doesn't fix any genre, however it can be split into three sections, drama, thriller and mystery! The story follows a depressed late night radio host (played by the talented Robin Williams) just having broken up with his boyfriend of many years. His agent gives him this inspirational book written by a young kid who had suffered a very hard childhood, filled with sexual abuse. The kid (played by Rory Culkin) bonds with Robin over the course of a bunch of phone calls, and Robin becomes excited at the prospect of being a father figure for the kid. Living with his foster mother, the Night Listener finds out that this child called "Pete" is also sick and is expected to die sooner rather than later. Definitely a great drama movie which leaves you thinking even after the movie has finished. Is it real or is it fake?